After incising the line of Told starting from the left colonic flexure down to the pelvic brim and distally along the spermatic vein to the internal inguinal ring, the splenocolic ligament is transected and the colon is dissected until the anterior surface of the aorta is exposed (Fig. 16). ■ As an option one may leave the splenocolic ligament intact and incise the peritoneum lateral to the spleen all the way up to the diaphragm. Thereby the spleen and the tail of the pancreas are reflected medially. Dissection of the lymphatic template is started distally at the crossing of the ureter with the common iliac vessels. 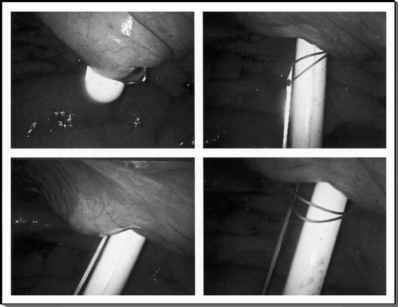 Normally the colon falls away from the operative field and retractors are only required in exceptional cases. 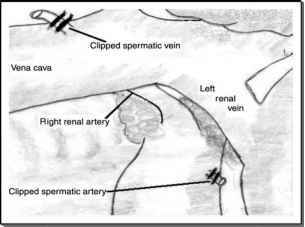 The spermatic vein is dissected along its entire course from the internal inguinal ring up to the renal vein and excised. The ureter laterally is then identified and separated from the lymphatic tissue with care to preserve its blood supply (Fig. 17). 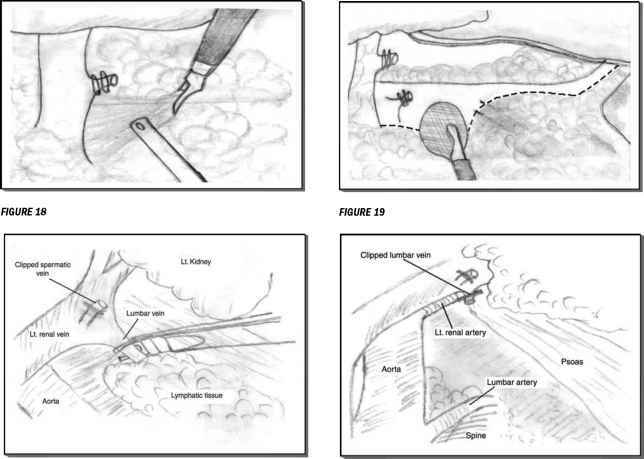 The left renal vein is then completely freed at this point (Fig. 18). Lymphatic tissues overlying the common iliac artery are split open. The dissection is continued cephalad circumventing the inferior mesenteric artery on the left side and preserving it. 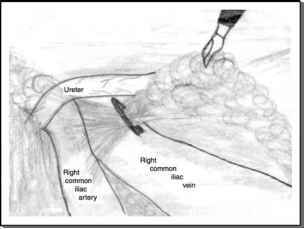 Cephalad to the inferior mesenteric artery dissection is continued along the medial border of the aorta up to the left renal vein. The spermatic artery is clipped at its origin and transected (Fig. 19). The lateral surface of the aorta is dissected down to the origin of the lumbar arteries. 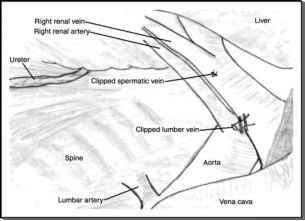 The lumbar vein, which is draining into the left renal vein, is approached and transected between clips to gain access to the left renal artery (Figs. 20 and 21). 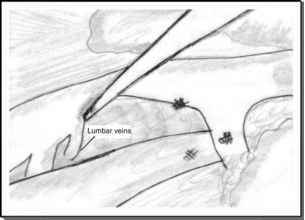 The lumbar vessels are dissected and separated from the lymphatic tissue to the point at which they disappear in the layer between the spine and psoas muscle (Fig. 21). 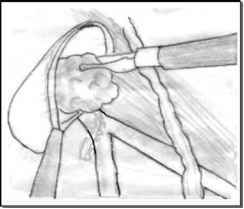 Lateral to that point the sympathetic chain is encountered. Although the left postganglionic fibers are readily identified, they are not preserved in template dissection because the right sympathetic chain remains intact providing undisturbed antegrade ejaculations. The nodal package will be completely free at this point and can be retrieved (Fig. 22). The colon is secured in its anatomic position with an extracorporeal tied suture. 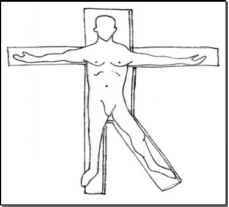 ■ The patient is placed supine under general anesthesia with the arms and legs apart (Fig. 23). ■ The patient is placed close to the table edge. ■ The surgeon stands ipsilateral to the tumor next to the assistant who holds the camera. ■ A video monitor on the opposite side provides a comfortable view for each operator (Fig. 2). 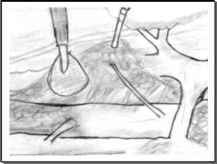 ■ Although, the Trendelenburg's position is not necessary, slightly tilting the opposite side of the table lateral may sometimes be helpful. ■ The trocar set consists of 10-mm balloon trocar, 10-mm trocar with reducer and a 5-mm ancillary operative trocar. ■ The instrument set includes a 10-mm 0-degree video laparoscope, an irrigation suction device, two atraumatic grasping forceps, a bipolar forceps, monopolar scissors, a clip applier, and an endoscopic bag for lymph node removal.